DestinyHoroscopes is the PUP that uses misleading techniques to prevent removal. Use Reimage to locate malicious components and get rid of them faster than with uninstall instructions. A full system scan blocks virus reappearance and prevents traffic to malicious domains. If you have been tricked into installing DestinyHoroscopes virus, you do know how annoying it is. No matter how tempting it looks to get a chance to “unlock your premium daily readings”, you should know that this program is an adware which cannot function without displaying ads on your web browser. 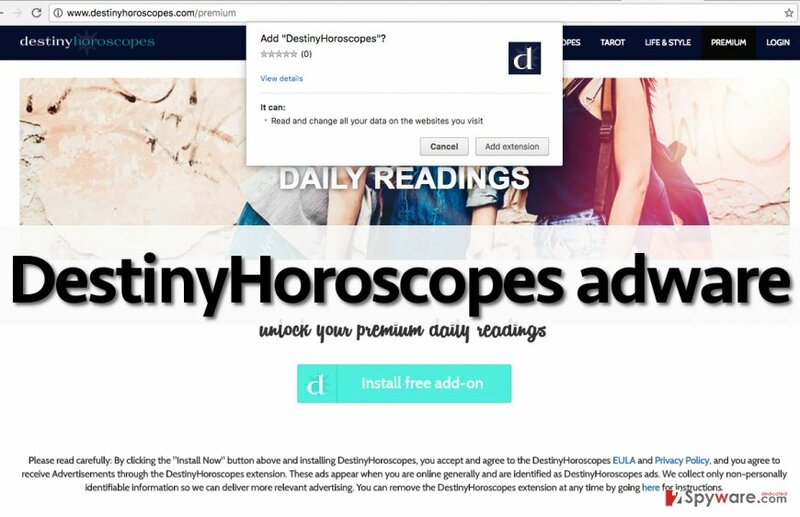 However, this is not the main reason why should you think about DestinyHoroscopes removal. According to the latest information, this program can also track you while you are on Internet and share information about your computer (IP address, its location, etc.) or web browser with third parties. Besides, redirects to questionable websites have become more and more common, so there is no doubt that you must ignore them. Typically, this adware displays pop-up ads in a form of pop-up windows, new tabs, banners, or third-party links that are integrated into websites that are visited by a user. Beware that the most of ads that belong to Destiny Horoscopes look useful and worth clicking. They can include price comparisons, information about discounts, surveys and similar content. However, they are generated for trying to earn pay-per-click revenue and increasing visitors’ traffic to needed websites. In other words, this program seeks to display targeted ads to convince the user to click on them, because it wants to monetize from users clicks. Every time a user clicks on a sponsored link, he/she visits a pre-determined website. This way, various third-party websites can promote themselves or products/services they present. Sadly, users who use such ad-supported programs do not seem happy about this advertising scheme. They often complain that websites advertised via such annoying ads often appear shady or even insecure and that they offer to install questionable pieces of software. Therefore, we want to advise you to avoid clicking on pushy web advertisements that aggressively pop-up on your screen out of nowhere. Besides, such adware programs often greatly decrease the speed of the computer, and that is yet another reason to remove DestinyHoroscopes from the system. You can delete it using Reimage or manually if you wish. You can download and install DestinyHoroscopes extension from its official website. However, you can also install it along other free programs without even knowing it. It is so because such suspicious programs often spread along other free programs and come in the form of “recommended downloads.” Naturally, inexperienced PC users might start thinking that “recommended” programs are trustworthy, sadly, it seems that these programs typically disappoint or simply annoy them. If you do not want to let DestinyHoroscopes hijack your computer, you should always reject all unknown programs added to your downloads. You can do that while installing these programs. Make sure you change installation settings from Default/Standard to Custom/Advanced option, and then simply take away marks from checkboxes next to suggestions to install additional programs or apply other suspicious changes. When attempting to remove DestinyHoroscopes virus, you should be very careful. It is recommended to entirely eliminate all suspicious programs that could be installed alongside it. However, detecting and removing suspicious files from your system manually can be a hard. That is why we always recommend choosing automatic DestinyHoroscopes removal method. You can use one of the programs listed below either to clean your computer from threats, or just to complete the removal process after an attempt to remove this adware from PC manually. If you face any obstacles while trying to uninstall this potentially unwanted application, fill out the question form via “Ask us” page. Here, look for DestinyHoroscopes or any other recently installed suspicious programs. Wait until you see Applications folder and look for DestinyHoroscopes or any other suspicious programs on it. Now right click on every of such entries and select Move to Trash. When in the new window, check Delete personal settings and select Reset again to complete DestinyHoroscopes removal. Once these steps are finished, DestinyHoroscopes should be removed from your Microsoft Edge browser. Here, select DestinyHoroscopes and other questionable plugins. Click Remove to delete these entries. Now you will see Reset Firefox to its default state message with Reset Firefox button. Click this button for several times and complete DestinyHoroscopes removal. Here, select DestinyHoroscopes and other malicious plugins and select trash icon to delete these entries. Click Reset to confirm this action and complete DestinyHoroscopes removal. Here, select Extensions and look for DestinyHoroscopes or other suspicious entries. Click on the Uninstall button to get rid each of them. Now you will see a detailed dialog window filled with reset options. All of those options are usually checked, but you can specify which of them you want to reset. Click the Reset button to complete DestinyHoroscopes removal process. This entry was posted on 2016-09-07 at 06:50 and is filed under Adware, Viruses. You can quickly scan the QR code with your mobile device and have DestinyHoroscopes ads manual removal instructions right in your pocket. How did you remove DestinyHoroscopes ads?